Crash 'n the Boys: Street Challenge, released in Japan as Bikkuri Nekketsu Shin Kiroku! Harukanaru Kin Medal (びっくり熱血新記録！はるかなる金メダル, "Astonishing Hot-Blood New Records! Distant Gold Medal") is a 1992 sports game for the NES by Technos Japan Corp. A Game Boy version of the game was also released in Japan only. The game featured Olympic style contests without rules or regulations, between five teams. The games included 400 metres hurdles, Hammer throw, Swimming, Roof Top Jumping, and Fighting Scene. It was re-released for the Nintendo Wii's Virtual Console on September 14, 2009. Theodore "Todd" Thornley IV has had enough. After being humiliated once again by Jeff "Crash" Cooney and his band of misfits from Southside High School at the All-City Track Meet, he has decided to challenge Crash and his friends to a contest. Inviting two of the other high schools to participate in the challenge, plus an additional team sponsored by his wealthy father, Todd has seemingly stacked the deck against his cross-town rival. 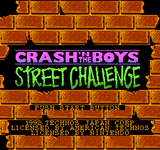 Source: Wikipedia, Crash 'n the Boys: Street Challenge , available under the CC-BY-SA License.